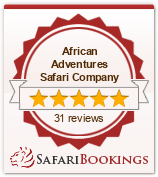 You will arrive in Johannesburg in South Africa to commence this exciting safari. After a pleasant night at a nearby lodge we will depart for the northern Drakensberg Mountains and the quaint village of Dullstroom. This town is unique in Africa as it closely resembles a Scottish Highland village and as such it is also the trout fishing capital of South Africa. We will spend two nights in this scenic town so that you experience some of the many activities on offer and wander the streets and boutique shops at leisure. If you love freshly cooked trout then this will be your chance to over indulge at any number of venues all with prices designed to keep you coming back for more. From Dullstroom we head to the very edge of the high veldt escarpment and the town of Graskop. On the way we can visit the National Trust listed town of Pilgrims Rest which has been frozen in time as it was at the height of the gold rushes in the 19th Century. Graskop is the gateway to the Blyde River Canyon which is one of the worlds natural wonders and a scenic destination of spectacular beauty. After a night in Graskop we leave the high plains (veldt) and descend to the wildlife rich Kruger National Park. We will be spending the next four days exploring this vast wilderness area and unlike most tours we will be staying INSIDE Kruger. Our home for the next four days is in camps setup by National Parks of South Africa inside the park and these are more like tiny towns than camps. Our accommodation will be in thatched rondavels with all the comforts of home and each one has full en-suite facilities. During our stay in Kruger I will conduct game viewing each day from our vehicle as we move through the park from camp to camp. You will have the privilege of being among the very few who gets to traverse the full length of this wildlife haven. This safari permits you to witness the huge variety of eco-systems and the wildlife that thrive in the variations of the bush we will encounter. Kruger is the home to “The Big Five” (lion, leopard, buffalo, elephant and rhino) and we will do our very best to find as many of them as possible. 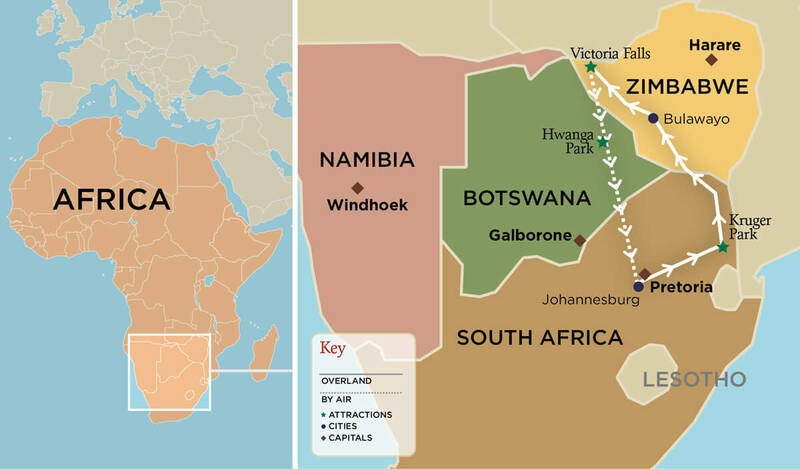 We exit Kruger through the most northerly gate in the park at Pafuri and then head towards the border with Zimbabwe. As the border crossing here is one of the worst and most time consuming in Africa we will spend the night near the Limpopo River and make our crossing the next day. Once into Zimbabwe we will notice the change in landscape as we drive to Bulawayo, the second largest city in Zimbabwe and the home of the Matabele Tribe. We do not spend our time is this historic town but we head out to the World Heritage listed Matobo Hills for two days of exploration and adventure. During our time here we will marvel at the spectacular landscape, encounter ancient Bushman cave paintings and even visit the spectacular location where Cecil John Rhodes is buried. In conjunction with all of this one of the highlights will be a half day specialised safari in search of the now very rare rhino. This is a once in a lifetime experience as your guide will actually get you out of your vehicle to track these ancient monsters on foot! After the excitement of rhino tracking we head further into the African bush as we travel north to one of the great national parks of Africa, Hwange. This is your chance to locate animals that eluded you in Kruger and the nice thing about Hwange is that it is so big that we will see very few other people during our time here. Hwange is also home to “The Big Five” but often some of the lesser known species can be just as exciting. There is the possibility of seeing the now rare Cape Hunting Dog and our lodge is often visited by hyena and even lion during the night. By the way there are no protective fences around our lodge as Hwange is a true wilderness park so you can be guaranteed a unique adventure. After our time in the bush we now head towards the adventure capital of Africa, the town of Victoria Falls. It is here that arguably the most famous water falls in the world are located and a visit to this World Heritage site will leave you astounded and most probably very wet. Victoria Falls town and the surrounding area has made its reputation also for providing unique activities that are suitable for all ages. You can white water raft, bungy jump, cruise on the mighty Zambezi River, ride an elephant on safari and even walk with lions. The possibilities are almost endless and that is why we spend three days here to enjoy as much as possible. It will be a difficult thing to have to say goodbye to Africa but it is from Victoria Falls Airport that you will fly out for home on day seventeen.